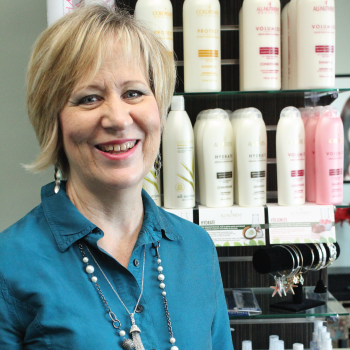 “Let’s just say I’ve been doing hair for 100 years,” says veteran stylist Mary Bruggeman, owner of MBA Hair Salon in Sola Salon Studios Wellington, FL. Mary spent most of her career working for other stylists. Sure, she’d considered flying solo – Who hasn’t? – but Mary always decided the risks weren’t worth the benefits. Besides, she says, “There are issues in every salon! It starts out good, but a few months in, there’s drama, favoritism and a manager’s broken promises.” That’s what Mary thought, anyway. One day on her lunch break, Mary saw a Sola sign. She was skeptical, true, but the wheels were turning. 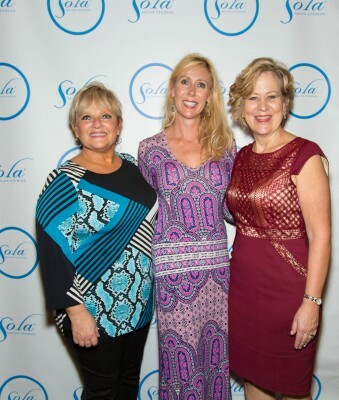 Mary dialed up leasing manager and owner of Sola Salon Studios Wellington, Heather Safrit. The tour – particularly the salon’s freshness and Heather’s professionalism – sealed the deal for Mary, who signed her lease nine months ago. At Sola, Mary explains, you don’t have a hairdresser running a business for other hairdressers. Rather, a skilled businessperson overlooks a professional company, leaving room for stylists to focus on what they do best. As far as Mary’s concerned, the result of that synergy is heightened professionalism and, also, greater earning potential: “Even if you have some freedom in a traditional salon, you’re only getting a commission, and the owner is getting a big take away,” Mary reminds. “Now,” says Mary, “I sell more retail than I ever had before, and I promote professional products that I’m passionate about, which makes it easier to upsell.” Thanks to ample shelf space, Mary’s even added a mini-boutique with “jewelry and sandals and fun things like that,” she says, adding, “It’s amazing the draw I’ve gotten there.” “This experience has stretched me in all of the good ways,” continues Mary. Salon ownership through Sola has pushed her to take charge by enhancing her marketing and technical skills. “Especially with the software,” Mary says, “It was hard learning that at first, but now it’s an indispensable part of my business.” Mary also expanded her repertoire – and clientele – by pursuing special occasion offerings. Florida, you see, is a popular destination for weddings, and, about five years ago Mary began working with another company to go on-site for weddings and special events. “That’s been a lot of fun,” Mary says, clarifying, “After doing hair for so many years, I still enjoy the basics – the color, the cuts, the highlights – but this speaks to my more artistic side.” Not all destination weddings are for out-of-towners, and Mary’s met new local clients at these events, too. She’s always excited to bring them back to her private Sola studio.